When the former State Fair of Virginia organization fell on hard financial times and filed for Chapter 7 bankruptcy in 2012, the state’s vast agriculture community was more than a little concerned. The fair, which began in 1854, showcased Virginia’s largest industry – agriculture – and was considered one of the state’s most cherished events. As a result, it’s easy to see why the thought of the iconic institution ceasing to exist was worrisome. Fortunately, the show went on. Mark Lovell, owner of Universal Fairs of Cordova, Tenn., purchased the fair, the event’s intellectual property and the 331-acre Meadow Event Park in Caroline County where the fair had been held since 2009. This was good news, but it was also the first time the state fair was not owned by Virginians, and that’s one reason the Virginia Farm Bureau Federation partnered with Lovell to jointly run the fair in 2012. The Virginia Farm Bureau also wanted a significant role in the State Fair of Virginia because Wayne Pryor, the organization’s president, was passionate about preserving and emphasizing agriculture at the event. Pryor was right. 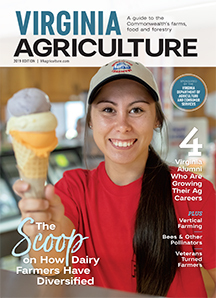 The 2012 State Fair of Virginia was a resounding success, and in 2013, the organization decided to do what no other state Farm Bureau had done before: The Virginia Farm Bureau became the sole owner of the fair. To date, the organization is still the only Farm Bureau in the U.S. to own a state fair. With its new owners at the helm, the 2013 State Fair of Virginia went off without a hitch, and attendees enjoyed the resurgence of favorite events such as a full complement of 4-H and FFA animal competitions and the Miss State Fair Pageant. Since then, the fair has thrived under the Virginia Farm Bureau’s ownership, drawing more than 200,000 people over a 10-day period, and it’s clear Pryor’s vision is resonating with attendees. Virginia’s agritourism trails highlight the state’s agriculture industry.